Most of South Australia is near deserted harsh arid land of the Australian outback. 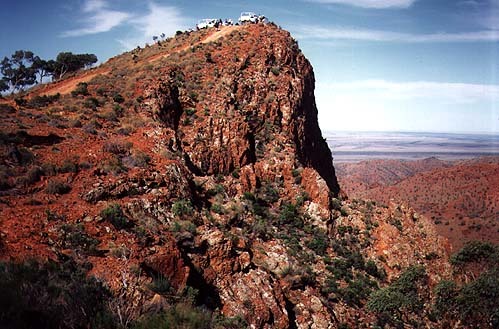 This has produced some quite dramatic landscapes, especially in the dry Flinders Ranges. In spring the entire mountains come into a bloom of flowers. The southeast corner of South Australia is green and fertile. The elegant state capital of Adelaide at the edge of the fertile lands has developed an big outdoor cafe culture and distinctly Australian cuisine. It has also retained many of distinctly South Australian style colonial stone buildings giving the city a timeless feel. In the Adelaide Hills is the old Lutheran German town of Hahndorf. Nearby is the Barossa Valley, which produces famous wines such as Coonawarra, mostly made by German descendants. The Fleurieu Peninsula is also close to Adealide. 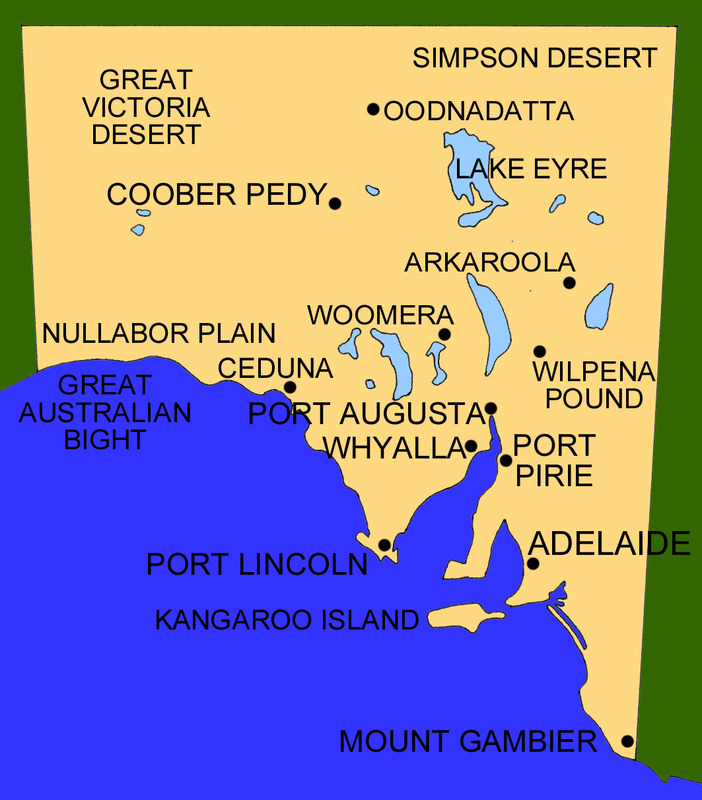 Port Augusta, north of Adelaide is regarded as the start of the hot dry outback. It is a rail and road freight transit town. North is the Stuart Highway to the Northern Territory passing through the underground opal mining town of Coober Pedy and the army rocket testing town of Woomera.The adventurous can take the Oodnadatta Track instead. West is the long road across the near deserted Nullabour Plain to Western Australia. The roads are remote with petrol as rare as every 200 kilometres. Take proper precautions. The Eyre Peninsula has a number of tiny sleepy fishing villages. At its southern tip is Port Lincoln, a bigger more sophisticated wheat and fishing town. Kangaroo Island is a remote natioanl park with a rugged coast line in the south of the island. Picture: Arkaroola, Flinders Ranges. 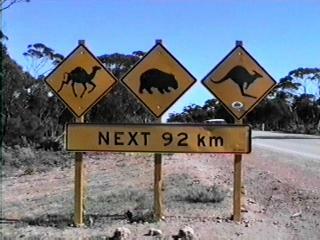 Map: South Australia Picture: Road sign on the Nullabour Plain. Transport services radiate from Adealide to all sizeable towns in South Australia. 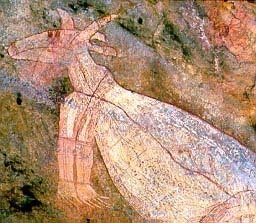 There are daily bus and occasional train services to Sydney, Perth, Melbourne and Alice Springs. Adelaide airport has flights to all Australian state capitals and regional South Australia. The major domestic carriers are Qantas and Ansett. Always ask for special deals or discount fares. These are more likely available if you book and pay one week or preferably two weeks in advance.